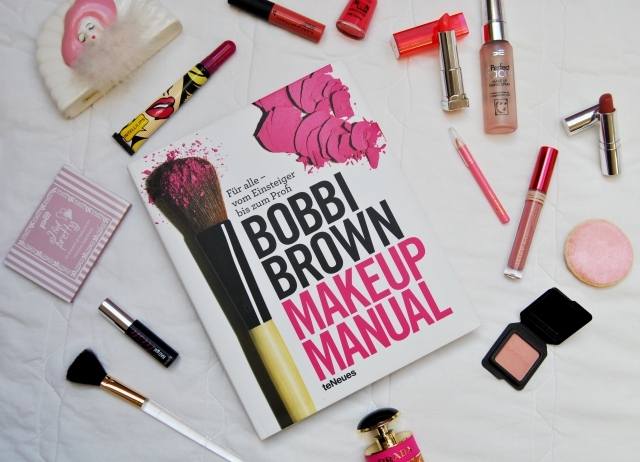 From all the beauty manuals out there the Bobbi Brown Makeup Manual is definitely one of the most famous ones. I was lucky enough to get it as a birthday gift more than one year ago and finally read through all of it last summer. In fact I really don't know why I didn't talk about it over here earlier but as it has become quite a famous book there is probably also the one or the other among you who'd like to know more about it. So the book claims to be a manual "for everyone from beginner to pro". Of course I can't talk about the pro aspect because I don't work with makeup professionally and I'm not even exceptionally good at it as a private person. So the view you will get is that of a normal girl who has been using makeup almost all her life and who has read countless makeup advices in magazines. Let's start off with the design and layout. The font is all held in black and pink and the pics are all really modern and neat. While the jacket of the book is really pretty, the actual cover is quite boring with just pencils on it. The writing style is unfortunately a bit distant and clinical and you can feel that the book has rather been written for pros and mature women than for young girls. The good part about this book however is that it covers really everything you need to know about facial beauty. 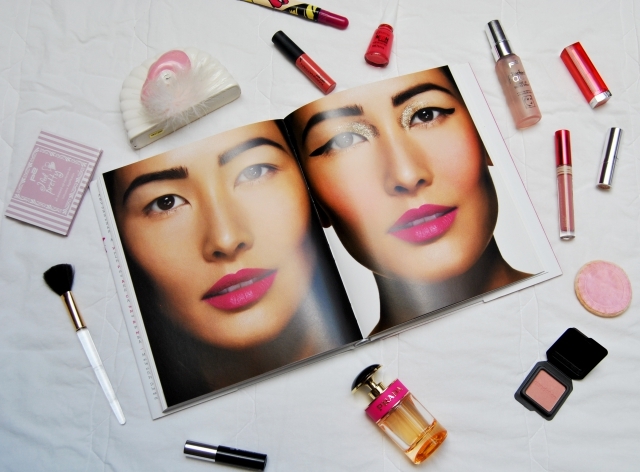 Be it equipment, skincare or makeup for every age and occasion: the book talks about it all. I especially liked the part about essential makeup equipment as it doesn't only tell you what you need but also where you can get it and how you can maintain it. Really handy is also the page about the expiration date of cosmetics. Then there was also a chapter about skincare which is an important matter for me. This chapter doesn't only cover cleansing and creaming but also the right food and lifestyle. The manual helps you find your skin type and introduces all the available products from eye-makeup remover to sunscreen. Every makeup tutorial (be it just the application of concealer) is illustrated by step-by-step pics and you always get special advices for every skin color. Furthermore there is an instruction for every mentioned product (for example separate tutorials for the application of powder blush and cream blush). In fact the makeup tutorials might at some point appear a little trivial but one must not forget that it is a book for beginner and pro alike. What I like are the little advices in between like "rules for the bride" or "bad-day beauty". The part about professional makeup art talks a lot about how to establish as a makeup artist or about how the makeup needs to be different for pics, magazines or movies. 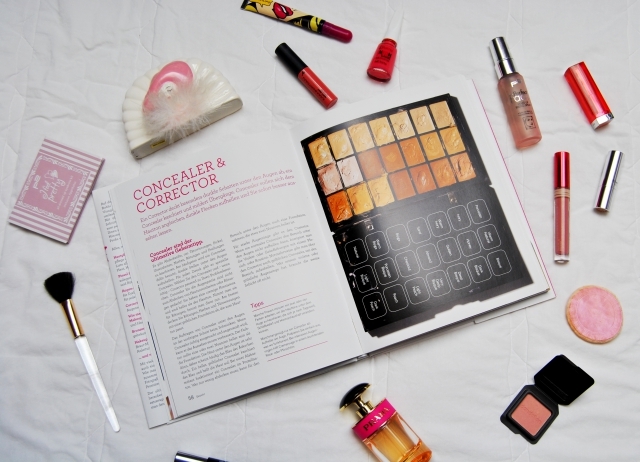 The book finishes off with the history of cosmetics, a who is who and a list of relevant addresses in the US. All in all it probably is a nice book for those who really only just start off with makeup but I wouldn't say it taught me that much. I might reread the parts about equipment and skin health but I feel that I can find more interesting makeup tutorials on the internet. Have you read this book or a similar one? Does anybody of you own Lauren Conrad's Beauty book? hi Carmen..i think this book is amazing, so interesting..
i absolutely love bobbi brown!! enter my valentine giveaway for a chance to win handmade knickers! Well sign me up to get this book - I actually never got these kinds of books but I could probably use it as I'm horrible with makeup haha. Love Bobbi Brown! Great book ! Curious to discover it ! I need to buy my copy asap, sounds so helpful! Thanks for your great comment, whether or not you're celebrating, from one blog friend to another...Happy Valentines Day! I just invest in this, I am hopeless with beauty, especially smokey eyes! Eeek! I def. want to buy LC's beauty book. She's a guru! What a well-written review! :-) I have heard many people rave about the Bobbi Brown Makeup Manual, but have yet to check it out myself! I love that it is targeted to both pros & beginners though! I am so with you; I am definitely no makeup expert, but I can do very basic looks with eyeliner and eyeshadow! 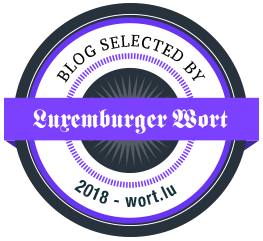 You have such a lovely blog! ^_^ I am now following you on GFC. Hoping we can stay in touch! PS: Love your little comment tidbit about how a "blog w/o comments is like Disneyland w/o children". What a great metaphor! I don't have any make-up books as I've always been doing my own stuff and learned through trial and error. It would probably interesting to flick through such a book to get some inspiration. I want that book, looks great!! It seems like such a nice book! I wasn't even aware she had this book out. It's really pretty! I don't know why they insist on making things so technical (writing style). It's already stressful enough to apply makeup (when you don't know). HAHAHA Great review Carmen! I'll check it out next time I'm at the bookstore. LOVE this cute post dear :) I hope you had a lovely Valentines weekend.